The first thing most people do when they visit Disneyland is head straight for the rides. To truly experience Disney magic, you need Walt to be your guide to his kingdom. Here's how a prominent group of Gonzaga alums experienced that for themselves while in Anaheim for Gonzaga's Sweet 16 games. The key is not to rush, especially right after you walk through the front gates. After you've gone through the ticket stalls, the first thing you notice is the train station. Or maybe the flowers underneath it shaped as Mickey. Start there. Of course, you're going to take a photo of it. You're probably even going to take a photo of your family in front of it. You're not alone. Not only is this one of the most photographed locations in all of Disneyland, but it's also one of the most photographed flower beds in the nation. More than 7,000 plants create it, including 4,500 of Mickey alone. They all get changed several times each year, as many as seven or eight times annually. Once you make it past the flowers, do you walk to the left or the right? But don't walk underneath the train tracks yet. Read Walt's message above you: "Here you leave today and enter the world of yesterday, tomorrow, and fantasy." He wanted you to leave the real world behind for a few moments. To make that point, Walt surrounded Disneyland with a berm. This was so that you literally couldn't see what was outside the park. He didn't want you to notice the cars or the hotels or the restaurants. Or even the people on the sidewalks. He wanted you to suspend disbelief, even if for just the few hours you spend with your family in the park. He also wanted it to feel like Disneyland was its own little town. The park used to even have its own newspaper. And before you go under the berm, you'll notice there's a mailbox. It's real. You can absolutely mail things from there. It's picked up daily. People used to use Disneyland's mailboxes all of the time. Long before iPhones, postcards used to be one of the most purchased items at Disneyland, and people would mail them directly from the park. Now we can actually start to walk into the park. Just don't forget to look down first. It's red brick. Walt was about to have you experience a living movie. He wanted you to enter it by having you walk your own red carpet, hence the red bricks. Then notice the popcorn stand. Once you've passed under the berm, the very first thing you can buy is popcorn because every great movie begins with popcorn. Yes, this is why people who work at Disneyland aren't called employees. They're called cast members. Next, walk over to the fire station, but don't go inside. 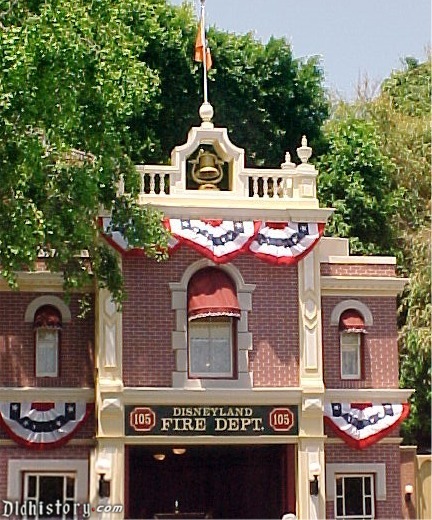 Walt loved fire stations. He loved horses. And he loved Disneyland. He wanted to be able to live there. So he built his apartment above the fire station. When Walt was alive, the lamp would be turned on so that cast members would know that the Walt was in the park that day. After Walt died in 1966, the lamp was left on at all times, because he is now always in the park. If you walk into the fire station, you'll see a fire pole. You'll also notice that the top is boarded up. When Walt was alive, that wasn't the case, allowing you to leave his apartment by sliding down the fire pole. Directly across from firehouse is the opera house. There are a lot of cool pieces of Disney history inside, but my personal favorite is the bench from Griffith Park in Los Angeles. One day while at Griffith Park, Walt was sitting on this bench watching his daughters ride the merry-go-round. He wished there was a place families could go to have fun together, a place that could be enjoyed by people of all ages. He came up with the idea for Disneyland while on that bench. Now let's head over to Main Street U.S.A. Stay on the right side of the street. These are the credits to Walt's movie. Movies used to begin with the credits so that audiences could appreciate the individuals who had worked on that feature. Walt wanted his theme park to begin with the credits, as well. The names on those windows are the people who helped build the park, with credit typically given in fun ways that were often inside jokes. But being on a Disneyland window was no joking matter. To this day, it's considered one of the highest honors given to longtime employees of the company who had some sort of special connection to the park. Now on to the magic shop. Since the park first opened in 1955, there has almost always been a magic shop. Actor Steve Martin grew up in the area and worked at Disneyland's magic store for three years. Walt used to always remind people that "it all started with a mouse." A little further down, you'll see the Main Street Cinema. It's not a prop or some fake building. Go in. It's a small movie theater with six different screens, all showing long-ago, black-and-white classic Mickey Mouse cartoons without sound. Five of the six films change from time to time. Except for the sixth screen, which always shows 1928's groundbreaking "Steamboat Willie" cartoon featuring Mickey. The Carnation Cafe has had many iterations since the park first opened, but what makes this version interesting is that it often serves Walt's favorite foods, including his chili. Now we need a Coke. As we head toward the castle, you'll notice there is a Coca-Cola shop. It's the entrance that has one of my very favorite secrets in the park. Look at the alternating red and white lights. That's how Walt wanted them. The problem was there weren't enough sockets for the lights to alternate correctly. The math didn't work. Two lights of the same color were going to have to be together. And this wasn't acceptable. The solution was fantastically simple. The light in one of the corners near the back has been painted both red and white, fixing the problem ever since. When that two-tone light burns out, a new one is painted. Once you notice this, you'll look for it every time you go by and delight in telling people about this simple but fun story. Isn't that a cute baby! We always see babies at Disneyland. Strollers are the official car of the park. Walt wanted all members of the family to be able to visit, even babies. If you cross the street at this intersection and head toward the corn dog cart - the best food in the entire park - you'll find an incredibly well-stocked nursery for babies. There's a comfortable nursing room, numerous changing tables and many other amenities for mothers and young children. And as one last reminder of where this all started, the old-time photo on the wall has a very cute baby on it. You get the idea now. You just needed to know the story behind the story to appreciate the simple sophistication of it all. And we haven't even made it to the castle yet. Visit the characters: Seeing Mickey Mouse - or more important, Chewbacca - is way more fun and will result in much bigger memories than you'll appreciate at the time. Get photos. Balloons: The Disneyland balloons are iconic. Especially when the walking vendor has about 50 of them with him or her, all flying above the crowd. Did you know you can ask if you can take a photo with them? You have to be nice. You have to say please. And you have to do it when the vendors don't have 20 people around them, all trying to buy balloons. There are many variables at play. But they very often say "yes." They will hold the end of the entire bunch of balloons so they won't fly away, allowing you to stand under them, strings in hand, with the vendor out of the frame of the picture. Once you're done, tell them "thank you" and buy a balloon. It's worth it and shows your appreciation. Carousel: Disneyland basically started because of a merry-go-round, and this one is spectacular. One horse is more beautiful than them all. You'll see it. Jingles is the one ornately painted. In 2008, it was changed to honor Julie Andrews and Mary Poppins, which is why see its crest is covered with references to the movie and the monogram "JA." Parade: Go to the second one of the day. It's the least crowded. But make sure you go to it. Disneyland does parades right. Fireworks: Walt wanted every day to end like it was the Fourth of July. He wanted your last memory to be something you'd never forget. Here's some crazy but important advice: Don't take a lot of photos. Let the cast take them for you. You'll get every one of them if you buy the MaxPass, which is the best deal in the park. Just enjoy your day. Let your memories be what matters most to you, not some iPhone photo that you'll never look at again. The rides are great. You should do them. You should just know that in 25 years, your family's memories won't be about The Incredicoaster. Don't take that wrong. The Incredicoaster is amazing. It's fun and incredibly well done. But it will be the simpler memories that actually make you feel more complex things. They are the things you will look back on and want to share with others. Those are the things you'll cherish. It's ironic that in life, the most important moments to us are often the ones we didn't necessarily understand at that time would wind up being the ones that mattered the most. Disneyland is filled with these surprisingly quiet, movingly sweet and personal moments, if you know how to seek them out and appreciate their significance. It's how Walt wanted you to visit his park.